Once in a while, something ‘goo related comes up that is too scarce and overtly desirable to ignore. Regular readers of KajaFax will remember some of our finer moments when we have featured bone-fide one-off items of memorabilia. Although not quite in the ‘one-off’ category, what we have today is pretty scarce nevertheless. Roll back to the 1980’s and the days when Germany was carved up into the prosperous West and the Communist East. Whilst the Federal Republic enjoyed glossy, colourful editions of ‘Bravo’ magazine which showcased lavishly promoted and seemingly wealthy pop stars, those on the easternmost side of the country in the GDR were not so fortunate. Their state owned harmony was not (for the most part) meant to be disrupted by western idealism. Kajagoogoo were one of the few exceptions to the rule that prohibited the promotion (via pop music) of western European values. Such ideas were, after all, polar opposites to the state controlled ideology. The pop magazine ‘Melodie und Rhythmus’ was one such outlet for ‘suitable’ foreign musicians to peddle their wares. 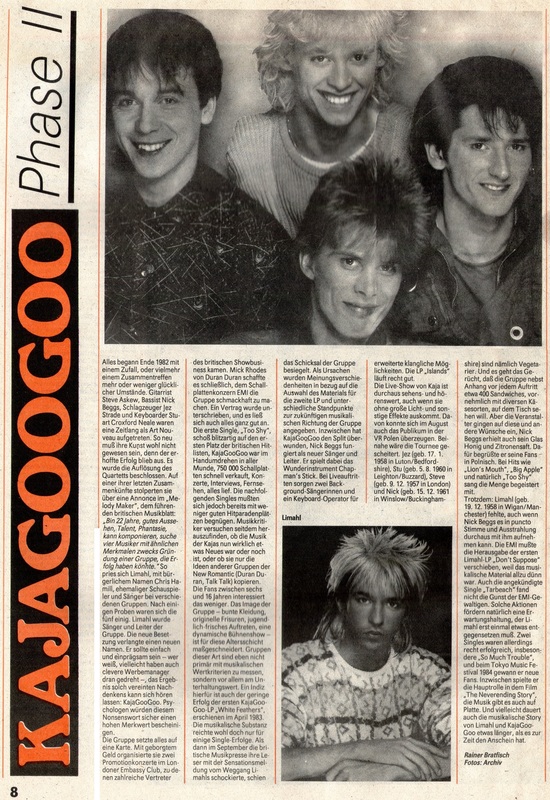 In the latter third of ’84, Kajagoogoo and Limahl graced the pages of the magazine which can (unusually for a periodical publication) be considered scarce. Why scarce? Well, such was the governmental control of all things essential to life back then that certain things were controlled by rationing – paper being one of those things. When supplies were exhausted, the printing presses stopped rolling. Due to the rationing of the paper and the subsequent low printing capacity in the GDR, the magazine was quickly sold out. This example not only made it through the print works whilst there was still sufficient paper left to finish the run, but also managed to survive the next 30 years intact. For those of you who are German speakers and via scans made from the original magazine held in our archive, hier ist der Deutsche originaltext. On behalf of the rest of us who speak only English, a kind request. If there are any German speakers who are able to provide a translation, please email us on admin@kajafax.com. Please click on the individual image to open a large scale version of the article in your internet browser. There are no words to describe these pieces of Memorabilia! KajaFax is a treasure Island for every old or new fan of Kajagoogoo and Limahl! Thanks for sharing your terrific collection with us!! give me one weekend ,and i will translate,as good,as i can ,ok?? so sunday,i will send a email to you.with the translationed request,ok?? i promise that to you,ok??? That is most kind of you Andy, thank you.